Echinofossulocactus phyllacanthus var. macracanthus Lawr. Brittonrosea phyllacantha (A.Dietr. & Otto) Speg. 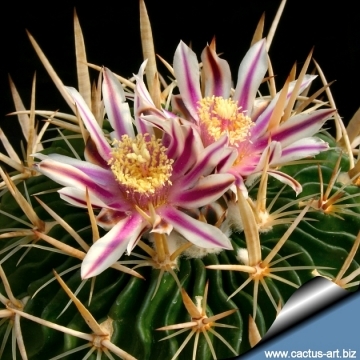 Description: Generally solitary round cactus with whitish to cream coloured spines and numerous wavy ribs. Older plants sometimes get corky near the base. The var. macracanthus has large flattened spines. Flowers: Abundant white with pink midribs. Stenocactus phyllacanthus (A.Dietr. 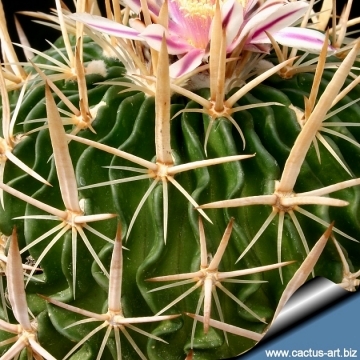 & Otto) A.Berger: Generally solitary round cactus with flat, flexible spines. Flowers 2-3 together, , yellowish white with brownish red throats, 15 to 20 mm long. Stenocactus phyllacanthus var. macracanthus (Lawr. ): has large flattened spines. 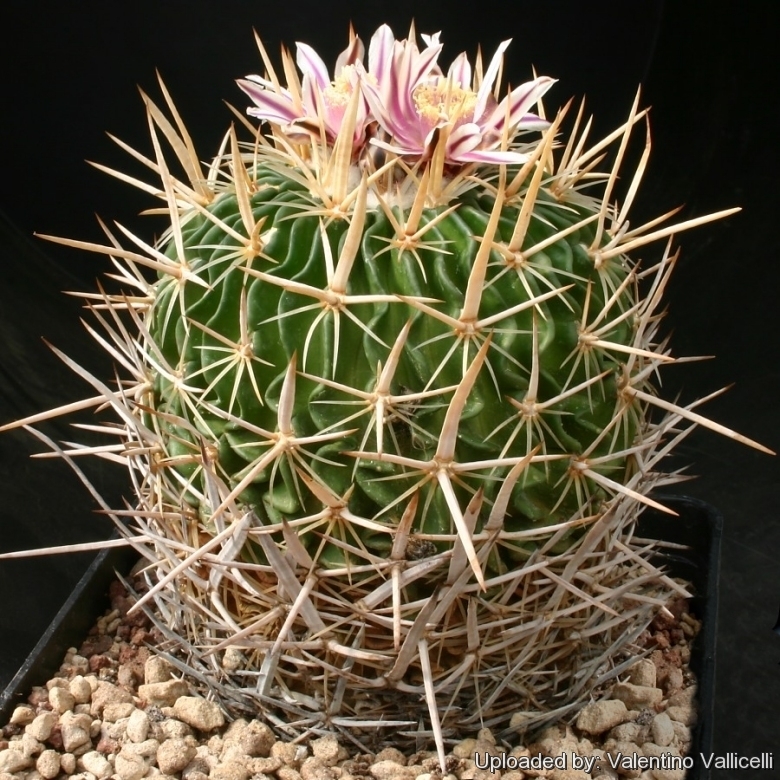 Stenocactus phyllacanthus var. violaciflorus: has larger, more numerous flowers with creamy white petals with pink violet midstripe (not yellow). Stenocactus tricuspidatus (Scheidw.) A.Berger ex Backeb. & F.M.Knuth: It is distinguished for the small sized yellowish blooms, very short flattened foliaceous central spines and few radial spines. It is a multiheaded species. Cultivation and Propagation: Easy to to care and flower. No absolute schedule can be given for watering as various factors (Soil mixture, containers, drainage, temperature, size of plant) influence water use, so - as a general rule - the soil should be thoroughly wetted at each watering during the active growing season (spring and summer), water when the top 1,5- 2 cm of soil feels dry to the finger. Do not soak the soil during the dormant period. Be careful, excessive watering can make root and/or stem to rots. Make sure there is good air circulation between plants. Good drainage is essential along good moisture retention properties and adequate nutrients availability. Require bright sunlight to grow well. Dormant plants do best at temperatures from 5-10°C (but will tolerate -5° for short periods). The cooler temperatures develop sturdier plants and encourage the formation of flower buds. Pests: The narrow ribs, the wooly areoles, and the dense spines are an ideal habitat for mealy bugs. Frequent inspection of the plants will prevent them from spreading.